Review posted April 7, 2018. Bolden Books (Agate Publishing), Chicago, 2017. 32 pages. It’s not often that a picture book wins Newbery Honor. Because the Newbery is given specifically for the text. In this case, we can’t write it off as a fluke, because not only did the 2018 Newbery committee think the text of this book was worthy of honor, the 2018 Coretta Scott King committee singled it out for the author’s work. Mind you, it also got honor from the 2018 Caldecott committee and from the 2018 Coretta Scott King committee for the illustrator’s work. So this picture book garnered a truly amazing four Honor awards. This book is about a black boy getting a haircut. But also about a black boy feeling great about himself. Mr. Tony was my barber in the sixth grade. To get to his chair, I rode the Prospect southbound Metro bus to 63rd St. every Thursday, the day of the week my mother would leave eight dollars on the kitchen table so that I could get my hair cut. Walking out of that shop, I never felt like the same kid that went in. I couldn’t wait for Friday morning so that Carmella Swift, my girlfriend, could see how perfect my box was shaped up. I knew she’d bug out about the two parts on the right side of my head, which, in my mind, made me look like Big Daddy Kane. There was no way she’d resist my ruler-straight hairline, a precise frame for my smiling, brown, 11-year-old face. That fresh cut made you more handsome. It made you smarter, more visible, and more aware of every great thing that could happen in your world. With this offering, I wanted to capture that moment when black and brown boys all over America visit “the shop” and hop out of the chair filled with a higher self-esteem, with self-pride, with confidence, and an overall elevated view of who they are. The fresh cuts. That’s where it all begins. It’s how we develop swagger, and when we begin to care about how we present ourselves to the world. It’s also the time when most of us become privy to the conversations and company of hardworking black men from all walks of life. We learn to mimic their tone, inflections, sense of humor, and verbal combative skills when discussing politics, women, sports, our community, and our future. And really, other than the church, the experience of getting a haircut is pretty much the only place in the black community where a black boy is “tended to” – treated like royalty. 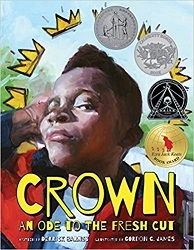 Crown: An Ode to the Fresh Cut focuses on the humanity, the beautiful, raw, smart, perceptive, assured humanity of black boys/sons/brothers/nephews/grandsons, and how they see themselves when they highly approve of their reflections in the mirror. Deep down inside, they wish that everyone could see what they see: a real life, breathing, compassionate, thoughtful, brilliant, limitless soul that matters – that desperately matters. We’ve always mattered. All the honor this book earned is testimony that the author and illustrator pulled this off with flair. Not really . . . but they’ll look like they want to. You’ll see it in their eyes. The first time I read this book, I wasn’t sure who I’d recommend it to besides black and brown boys. But this book is a celebration! It’s going to uplift anyone who reads it. And I, for one, am now in a position where it’s just a little easier to see that kid coming up to the information desk as the living, breathing, compassionate, thoughtful, brilliant, and limitless soul he is. As with all picture books I review, you really need to check out this book yourself and enjoy the pictures to get the full experience. This one’s highly recommended.